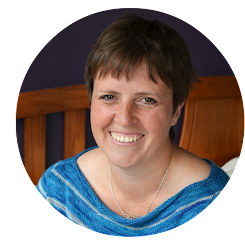 One of the fun things about being involved in the New Zealand Post Book Awards for Children and Young Adult Book Awards 2014 is that I get to find out a bit more about the people behind the books. 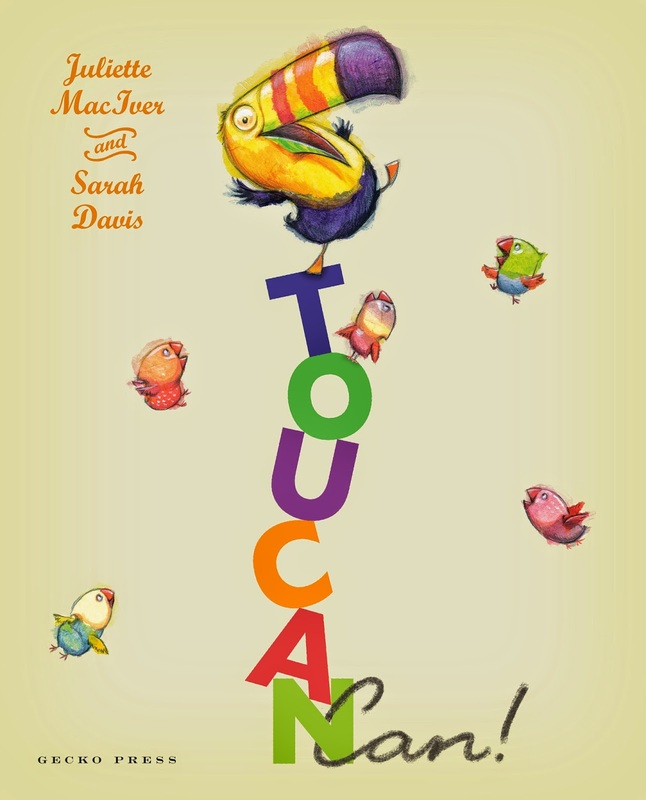 Today I'd like to introduce you to Sarah Davis, the illustrator of Toucan Can. What was your approach to illustrating this book? The character of Toucan really appealed to me, and clearly he had to be the focus of the book. I was imagining him as a bit of a showman - lots of razzamatazz and showing off, and mischief. He's a bit of a troublemaker, and I imagine him to have poor impulse control! So all my plotting and planning focused round Toucan as a nexus of chaos. Character design took quite a lot of time. I also wanted to develop a free, joyful colourful style for the book, which meant I had to loosen up quite a lot and be spontaneous, and trust myself more than I usually do. I developed a technique that forced me to be less precise - hand painting tissue paper and doing rough tissue paper collage with linework over the top. Tell us a bit about the journey from storyboards to published work. What was the biggest challenge you faced in illustrating this book? Before you skip over this, can I urge you to follow the link and read the post. I found it fascinating to see how the character emerged and I'm sure you will too! How closely were you able to collaborate with the writer? Do you prefer to work this way? I know Juliette really well, and she's lots of fun. We've become very good friends. We quite often go back and forth on things, and we have a similar sense of humour so we sort of get where the other is coming from. Toucan actually got published because Juliette showed it to me one day over a cup of coffee and it made me laugh so hard... I desperately wanted to illustrate it and recited the text to Julia Marshall from Gecko Press one day when we were catching up in Sydney – and she fell in love with it too, and decided to release it on an unsuspecting world. I normally prefer NOT to collaborate with the author, but Juliette is the exception. Can you recommend any illustrators whose work you find yourself particularly influenced by? I've given up on influences, because all these illustrators I admire do what they do so much better than I could ever hope to. So I just enjoy them now - I don't try to make my work like theirs, because what I admire in them is how true their work is to a unique internal vision that is distinctly their own - that's what I would love to achieve! I still feel like I'm a bit all over the place, and haven't quite worked out what I'm all about. Illustrators I love are Sean Tan, Edward Gorey, Gus Gordon, Leila Rudge, Maurice Sendak, E.H. Shepard, Norman Lindsay, Arthur Rackham, Jeannie Baker, Chris Van Allsburg... and many more whose names escape me right now. I just LOVE looking at other people’s work. What was your favourite thing to draw when you were at primary school – did you have a “party trick”? Tell us about a time you’ve enjoyed relaxing and reading a book – at the bach, on holiday, what was the book? The Secret Garden by Frances Hodgson Burnett. I took the book up a hill and into the tussock, so I was surrounded and shaded by long grass. The only sounds were the bleating of sheep, the lull of the waves, and the wind in the grass. I disappeared into that book, and was totally carried away by the story, hidden all day on top of the world with a gentle sun shining. I finished the last chapter just on dusk, and walked back to the bach feeling like I was returning from another Universe. I was so inspired by the beautiful illustrations in Toucan Can that I asked Sarah if she would mind if I created a paper pieced Toucan Pattern. I am thrilled to say that she enthusiastically agreed. I have made a Toucan cushion cover which I will be giving away some time in the next few days. 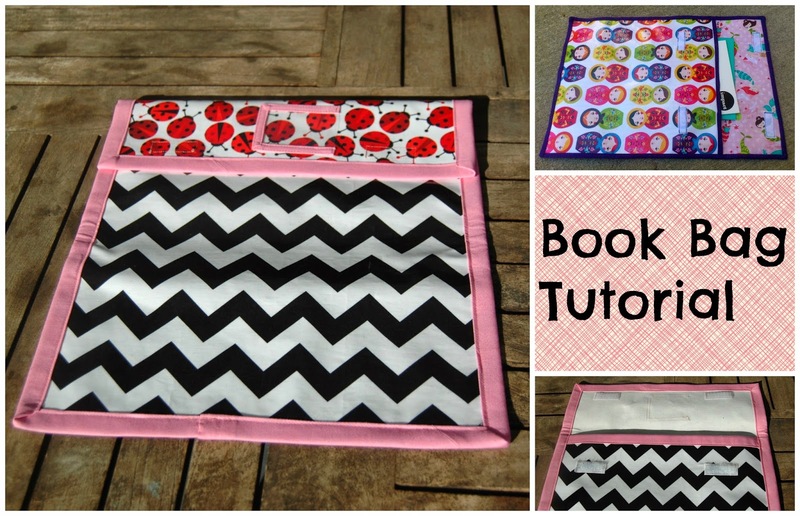 I will also make the pattern available to you, my book loving quilter friends too. More on that in the next few days! 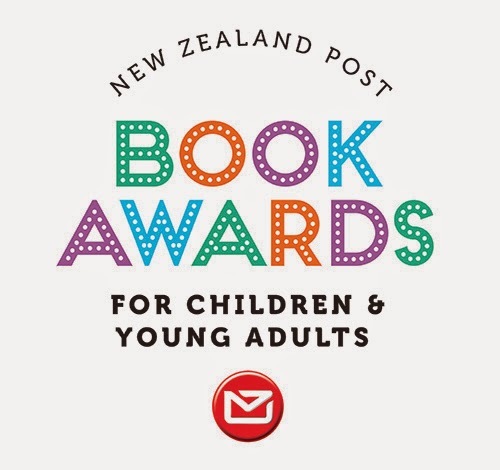 To find out about the other finalists in the New Zealand Post Book Awards for Children and Young Adult Book Awards 2014, keep an eye in the Booksellers New Zealand Blog. Your Toucan just radiates personality. I enjoyed reading about the book and the illustrator. That pattern is freeking great - looks exactly like the pictures! And I love Sarah's work - great interview! I love it - such wonderful colors. What a character!! Such a bright and happy looking Toucan! That is so cute...what a colorful creature. Can't wait until you publish the pattern. I love your Toucan! Wow! Oh my gosh! He's funny! Bravo to you for capturing the character of Sarah's illustrations so well. He's just charming. 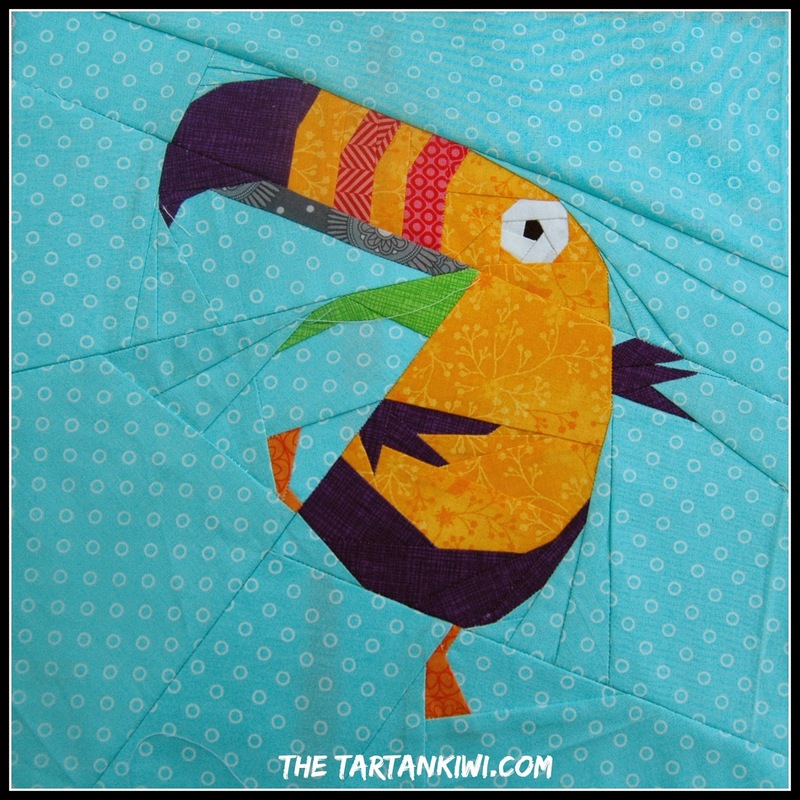 What a cheerful little toucan you've created! I love him. And what a great way to make the character of Sarah's illustrations come to life in a tactile way. Well done!